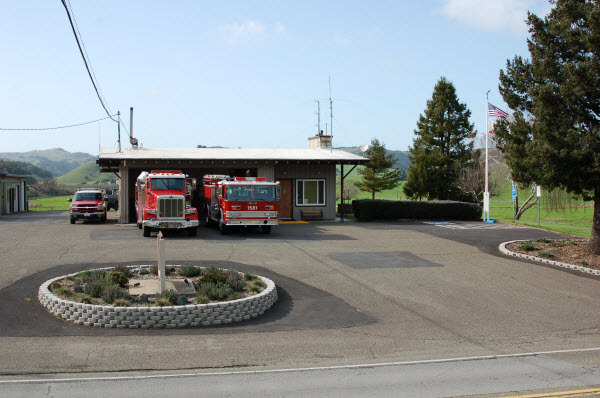 Hicks Valley Fire Station is located in the rolling hills between Point Reyes and Petaluma. This station provides protection for numerous ranches and is dispatched into Sonoma County routinely as a mutual aid resource. Hicks Valley is unique for it protects the last three remaining one-room school houses in Marin County. The department's sewing shop is housed in this facility. Custom hose packs, straps, and softgoods are manufactured here by firefighters. This station also performs fire hose maintenance and repair. Mutual Aid is provided to the community of Novato. Automatic aid is provided to the Wilmar Fire Department and the San Antonio Volunteer Fire Department.